Attention This product is a JUMP FORCE Steam key (although it may also be available in other versions such as the Steam Gift), depending on which store you buy. Each format has a specific activation form and may have a regional block, so we recommend reading the specifications in each store. Don't forget that from Gocdkeys you can buy the best prices for this and many other games in online stores. JUMP FORCE is an action and combat game in which we can face all the most famous heroes of Manga. Select one of the available heroes, including Son Goku, Naruto, among many others, and engage in combat against the most powerful enemies, all with a really impressive visual and graphic look, with a level of detail never seen before in a fighting game. Unleash the power of the manga's most famous heroes and execute the most characteristic attacks on each of them to take out your rivals. 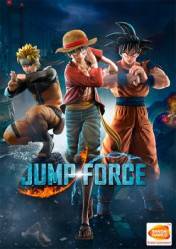 The Standard version of JUMP FORCE, which simply includes the original game, although many stores may offer a bonus per booking that includes 3 skills for your Avatar and a vehicle. JUMP FORCE Deluxe Edition, which includes the game and the content package "The Characters Pass" which gives access to 9 additional characters + their respective costumes and moves. In addition, we can also enjoy 4 days of early access. JUMP FORCE Ultimate Edition, which includes 4 days of advance access to the game, plus the "The Characters Pass" package with the 9 additional characters + their respective costumes and moves, and 16 exclusive t-shirts for your totally exclusive Avatar, in addition to other ingame bonuses. Remember that from Gocdkeys we compare prices for all versions of Jump Force, simply choose your version from the selector at the top of the list. There are no comments yet about JUMP FORCE. You can be the first one!